Hawkeye, Tigra and Quicksilver are turned into mindless robots. And Ultron-13 makes a surprising ally. Ultron-13 reveals his big plan to Hawkeye, Tigra and Quicksilver, who have been captured and are trapped in giant glass tubes. Ultron-13 just doesn’t understand this thing called life, which is why he’s using his robotize spray to turn humans into mindless robots (or “andrones”). Soon there won’t be one “flesh and blood human being left upon the face of the earth!” Ultron-13 then robotizes his three prisoners. While all of this is going down, the Grim Reaper stumbles upon Ultron-13’s secret lair and hears of the robot’s evil plan. He tries to stop Ultron-13 because a world without human beings would mean death for the Grim Reaper. However, he’s subjected to the mental waves being broadcast from Ultron-13’s artificial brain. Ultron-13 is fascinated by the Grim Reaper’s recent transformation and his scythe. Using his eye beams, he performs surgery on the Grim Reaper and fuses the scythe to his body. This impresses the Grim Reaper and he agrees to work alongside Ultron-13. Hank and Wanda go to UCLA to use the university’s super-computer, much to the annoyance of Dr Falk (a random professor/scientist who doesn’t like super-heroes using their equipment). Pym figures out that the metallic flakes on the spray victims from last issue might be reversible; in fact, a specific kind of light might do the trick, only he doesn’t know which one. 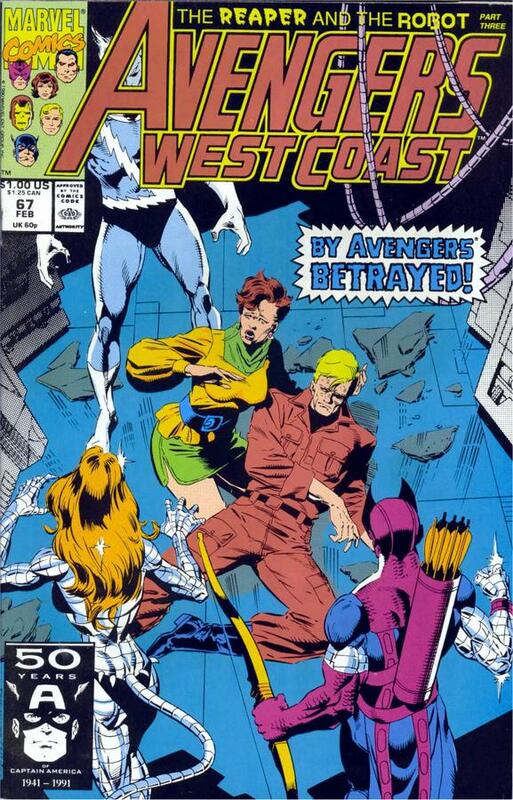 Before he can find more answers, the robotized Hawkeye, Tigra and Quicksilver attack. They knock out Pym and start destroying the equipment. Dr Falk is not impressed by this. U.S. 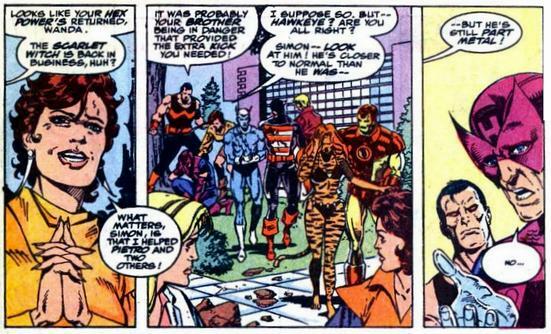 Agent, Iron Man and Wonder Man show up to stop the androne versions of their teammates. But the fight doesn’t go well at all. With the team running out of options, Pym finally wakes up and tells Iron Man to hit them with light. He activates his uni-beam and uses different lights until the infrared begins to affect the andrones. They can’t figure out how to reverse the effect of Ultron-13 ‘s robotize spray. Iron Man keeps hitting them with infrared; however, since there’s an infinite number of frequencies, it could be years before they figure out which one can save their teammates. Once Wanda hears about luck, she struggles to use her powers for the first time since her time with Immortus. Just as Iron Man’s uni-beam is about to give out, Hawkeye, Tigra and Quicksilver revert to human. Everyone is happy, especially Wanda who now has powers again. However, it’s not all good news, as Hawkeye’s hand is still metal. When questioned, Hawkeye, Tigra and Quicksilver don’t remember what happened to them or who was responsible for their transformation. The issue ends with Ultron-13 revealing that his master plan to change humans to robots will begin at the Rose Parade…which doesn’t sound dramatic at all. Roast. This one doesn’t work for me. And really, the Rose Parade? Hawkeye used to be all metal until he sold out!